Central is a special place that cares about people and equips students and faculty to make a difference in the world. Through your gifts to the college you can have an immediate and lasting impact on students’ lives through scholarships and teaching excellence. Gifts to The Journey Scholarship Fund provides annual scholarships for students at Central College. Gifts to the Central College endowment allow donors the opportunity to create a life-time legacy of support of Central College. Endowed funds may be unrestricted, which means they can be used wherever the need is greatest, or they may be designated for a scholarship, faculty position or program. Central offers the following gift levels to create an endowed fund. Learn more. Gifts to academic department venture funds allow those departments to fund such things as equipment purchases, faculty and student research and travel stipends, professional conferences and other needs specific to their individual areas. Venture funds are managed by individual departments. Gifts to individual sports programs excellence funds assist our athletic teams with such things as uniform and equipment purchases, travel to tournaments, and other programmatic needs which may arise. Interested in making a gift? Check out all of the ways to give to Central. Every gift to Central College matters, and your support directly assists students in realizing their goals of a Central College education. Whether your gift is $25, $100, $500, $1000 or somewhere in between, your participation by making a gift is just as important as the amount you give, and we are grateful for your support. Double, or even triple, your gift! Many companies match employee, employee spouse or retiree gifts to non-profits. Most match 1-to-1, but some even match 2-to-1 or 3-to-1. Some companies even match gifts made by retirees and/or spouses. That could double or triple your gift to Central College. Companies use various methods by which employees can request matching gifts — online forms, automated phone systems or paper forms completed by the charitable cause. To get the best information, contact your company's human resources officer to discover your options. See if your gift to Central qualifies for a match. Call the Central College Advancement Office and make a gift over the phone using your Visa, MasterCard or Discover credit card. Perhaps you have a favorite credit card that earns reward points or cash back. The call is toll-free: 800-447-0287. 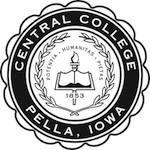 Founded in 1853, Central College of Pella, Iowa, is a private, residential four-year liberal arts college known for its academic rigor and strength in global experiential learning, STEM (science, technology, engineering and math), sustainability education, athletics success and tradition, and leadership and service. Central continues to value its long-standing relationship with the Reformed Church in America. The college participates in NCAA Division III athletics and is a member of the Iowa Conference. Central is an active part of the Greater Des Moines region and just two minutes from Lake Red Rock, Iowa’s largest lake. Learn more about our history. Read our welcome statement and our covenant with the RCA. The College nurtures the development of the mind, while fostering spiritual and emotional maturity and physical well-being. Central integrates career preparation with the development of values essential to responsible citizenship, empowering graduates for effective service in local, national and international communities. 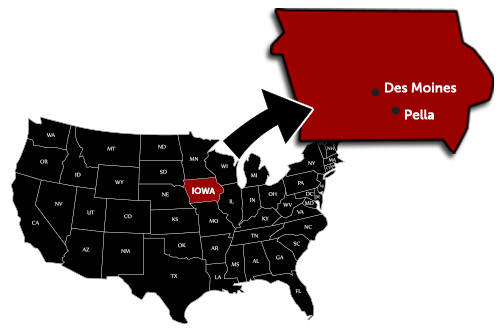 Location: Pella, Iowa, just 40 minutes southeast of Iowa's capital city of Des Moines and two minutes from Lake Red Rock. Pella is a thriving community of 10,000 and home to several large international companies such as Pella Corporation (Pella Windows), Vermeer Corporation, Heritage Lace and Precision Pulley. The city of Pella is known for tourism and the annual Tulip Time Festival that brings over 200,000 visitors each year. Learn more about Central's accreditation. Central College is a leader in environmental stewardship in Iowa and the Midwest. Iowa's first Leadership in Energy and Environmental Design (LEED) rating, silver, by the U.S. Green Building Council in 2003 for the renovation of the Vermeer Science Center. Earned gold LEED rating in 2004 for McKee Residential Hall. Received platinum LEED rating in 2010 for the Roe Center. Central is committed to LEED guidelines for all new campus construction and to an environmentally friendly campus. Learn more about Central College's commitment to the environment and campus sustainability efforts.